The Radbot™ 1000 has absolutely knocked my socks off for one simple reason: in the two months I’ve had it, the Radbot has yet to spontaneously turn itself on while floating around in my messenger bag. This is huge, folks! And, unlike most of its competition, the Radbot’s light continues to operate at full power as the battery life wanes, which was great, until the batteries died completely and left me in the dark, still 5 miles from home. But the built-in reflector on the bottom half of the light kept me feeling (relatively) safe for the rest of my ride. I would say that the Radbot has far exceeded my expectations. The Radbot™ 1000 is a combination light and reflector, a great idea if you are trying to minimize the number of accessories on your bike and your batteries die at night! 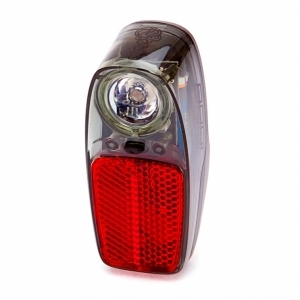 A half watt LED with three different flash/steady modes and a 30-hour run time lets everyone know there is a person on a bike ahead of them that wants to be seen. There are a few details that may escape notice when first looking at the light. The on/off switch is located between the reflector and the light on the face of the unit, possibly helpful in keeping moisture from damaging the switch should it invade the light and gather at the bottom (a common location for switches on other lights). The switch must be held down for 1.5 seconds to turn the light on or off, helping to keep it from turning on accidentally while in your pocket or bag. Is there anything worse than discovering that the battery is dead because something in your pocket had turned it on? The Radbot also comes with three mounting brackets, one for your seat post, another for your seat stays, and a third (usually an option that must be purchased separately for most lights) for attaching to the reflector mount tab on most racks. This month we’re celebrating local products with a special promotion. If you buy a local product like PDW’s Radbot™ 1000, or one of the other lights that we’ll be profiling next week, we’ll give you a free Community Cycling Center water bottle.